The prolonged inaction had been a cause of increasing frustration among developing countries. Paulo Nogueira Batista, current deputy president of the New Development Bank (NDB) and former IMF executive director of 10 Latin American countries, including Brazil, was quoted in Euromoney magazine in September revealing that “[o]ne reason for the creation of the NDB is undoubtedly the slowness of the reform process in the Washington-based institutions.” The establishment by China in 2015 of the Asian Infrastructure Investment Bank, which now has a membership of 57 states, is also widely considered to be a response to the lack of governance reform at the World Bank and Fund (see Observer Summer 2014). 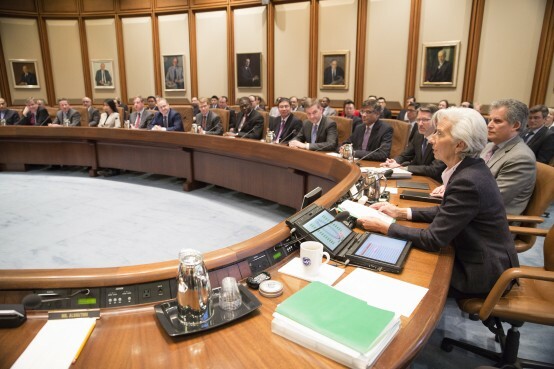 Once in force, the reform will substantially increase the Fund’s financial resources from about $330 billion to $660 billion through a doubling of the IMF’s Special Drawing Rights (see Update 65). The reform will shift more than six per cent of quota shares to emerging market and developing countries. Brazil, Russia, India and China benefit from an increase of 4.5 per cent of voting shares, which now amount to 14.3 per cent of total IMF voting power. China will become the third largest member country in the Fund. While the reform reduces the US’ current share of 16.7 per cent to 16.5 per cent, the US maintains its ability to veto decisions at the Fund. The governance reforms do away with the category of appointed executive directors, which currently benefits the members with the five largest quotas. The advanced European countries will reduce their combined Board representation by two chairs from eight or nine chairs, depending on the rotation of European chairs with non-European members. Finally, many poorer countires lost substantial shares of their voting power, including Nigeria (-41 per cent), Venezuela (-41 per cent), Libya (-39 per cent) and Sri Lanka (-34 per cent). Less than a month after Congress’ approval of the quota reform, the quid pro quo demanded by Congress was approved: that the IMF’s exceptional access lending rules, which had been brought in to enable the IMF to lend to Greece, be eliminated. Members of Congress opposed the rule on the grounds that it gave the Fund too much flexibility and put the Fund’s money at risk. Prior to the Greek crisis, countries in distress and with unsustainable debt burdens were required to restructure and reduce their debt burden before the Fund could lend. In 2010 however, in response to the situation in Greece, the IMF’s executive board passed a systemic exemption clause bypassing the requirement for debt restructuring and authorising the lending to Greece (see Observer Summer 2015). The systemic exemption, which allowed loans to Greece, Portugal and Ireland, has been criticised by developing states as biasing developed countries and as an example of a double standard by the Fund (see Update 86). US Congress’ approval was essential in ensuring that a potential confrontation between the US and emerging and developing members was avoided during the 2016 IMF and World Bank spring meetings in April 2016. Christine Lagarde’s five-year term as IMF managing director ends in July of this year. The IMF’s board announced in mid-January that it has opened a “process for the selection of the Managing Director, similar to the one used in the previous round” and that “individuals may be nominated by a Fund Governor or Executive Director.” The nomination process closes on 10 February and a decision “by consensus” is expected by 3 March. The continued leadership of the Fund by a European in the absence of a competitive, merit-based, open and transparent selection process open to any individual without regard to nationality would demonstrate that demands made by civil society (see Update 75) and proposals put forth by the IMF’s Independent Evaluation Office’s 2008 background paper are yet to be acted upon. While the Financial Times newspaper in January stated that Lagarde “is widely considered a sure bet for a second mandate”, it noted that Lagarde “faces a trial in France this year over her role in a 2008 payment to businessman Bernard Tapie … Ms Lagarde is accused of negligence in public office in relation to misuse of public funds, an offence that carries a maximum sentence of one year in prison and a fine of up to €15,000.” The IMF board has expressed its confidence in the current managing director. Despite Lagarde’s legal concerns, the governments of Germany, France and the UK expressed their support for the renewal of a Lagarde second term as soon as the nomination process was opened in January. The US government also expressed its support.